This Saturday, 12 April, Tiësto’s Musical Freedom Records presents its first NYC showcase at Brite Nites @ Webster Hall. Emerging artists Dzeko & Torres, Baggi Begovic and MOTi will hit the Webster Hall stage to celebrate the first anniversary of the popular Brite Nites dance party. Dzeko & Torres have made a name for themselves with a string of eclectic remixes for artists ranging from Of Monsters and Men and Animal Kingdom to Trey Songz and Chuckie. One of their latest remixes, a collaboration with Tiësto on John Martin’s ‘Anywhere For You’, is currently cranking in the sets of some big name DJs. Still buzzing off the experience of being invited on stage at the Ultra Music Festival by their mentor Tiësto, Dzeko & Torres should be looking forward to the gig. 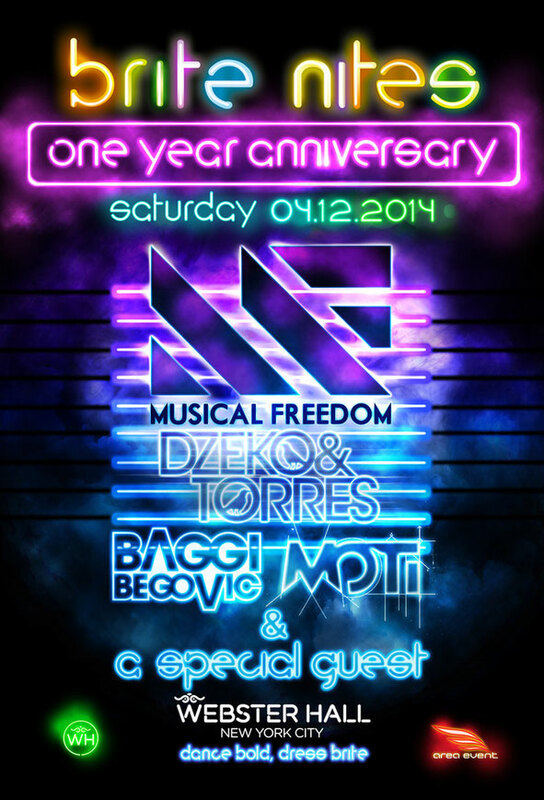 Baggi Begovic makes his Webster Hall debut at Brite Nites’ first anniversary celebration. This stop is one of many on Begovic’s “Baggage Claim Tour” that culminates next month at EDC New York. Musically, Begovic recently released ‘I Know U’ (Musical Freedom) that follows the track ‘Sleep Till I Get Home’ (both tracks in collaboration with Team Bastian). Begovic currently hosts “Baggage Claim” on Sirius XM Club Life Radio, which is also available as a free podcast on iTunes. MOTi’s recent release, ‘Don't Go Lose It’, reached as high as #4 on the Beatport progressive house charts while, in addition to his own solo slot, Tiësto invited him onstage at Ultra Music Festival for the world premiere of their new collaboration.